Pink dinosaur bone engagement ring or wedding ring with a pear shaped white sapphire set in sterling silver by Hileman Silver Jewelry. This dinosaur bone ring would make a unique wedding or engagement ring for someone looking for a non-traditional wedding ring option. 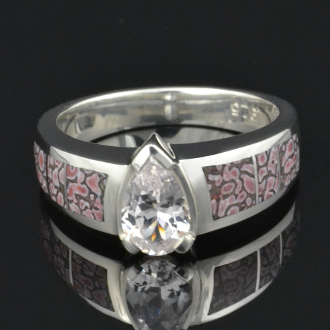 The ring is inlaid with 3 pieces of pink dinosaur bone on each side of the white sapphire center. The pear shaped white sapphire weighs 1 carat and is held in place with 2 side prongs and a "v" prong on the end. The width of the top section of the ring is 6 mm with the white sapphire extending out to 9 mm at the widest point. It tapers down to 3.5mm at the bottom of the ring (shank). The ring in the photo is shown in a size 7 for scale. This dinosaur bone ring will be made to order in your ring size in approximately 4 to 6 weeks depending on the work load. A matching 4.5mm dinosaur bone wedding band is available if you would like to make a bridal set. Watch the video of this dinosaur bone ring below. **I recommend upgrading to Continuum sterling silver for all wedding ring or heavy wear jewelry. It will be much more durable than standard sterling silver and should extend the life of your jewelry. Read more about this new tarnish resistant sterling silver alloy option. See more of our dinosaur bone rings!